The Inner Goddess Detox Salad is chock full of healthy body cleansing ingredients that can eliminate toxins from your body while brightening your skin at the same time! With ingredients like dark, leafy greens, fresh veggies, and juicy berries, you know it’s going to be extremely good for you. This salad is a great meal anytime you want something light and refreshing. Kale comes with high concentrations of antioxidant vitamins A, C, and K; While spinach comes high in vitamin A, which helps keep skin soft, bright, and supple. 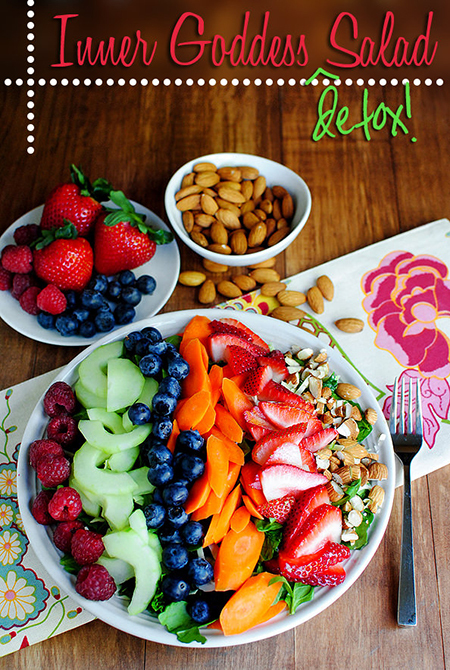 Stop waiting and try making this delicious detox salad at home right now! 1) Begin by washing your kale and tearing the leaves from the stalk and into bite-sized pieces. You should end up with about 2 cups of leaves. 2) Rub the raw kale down for about 1 minute or until the leaves become soft and tender. 3) Add 2 cups of torn baby spinach on top. 4) Finally, add 1 cup shredded cabbage to the salad base. 5) Toss the kale, spinach and coleslaw together in a bowl, then place a lid on top and flip. 1) Start with chopped almonds, one of the best food sources of vitamin E to nourish and protect skin, and sliced strawberries, which may help diminish the negative effects of a high-fat meal. 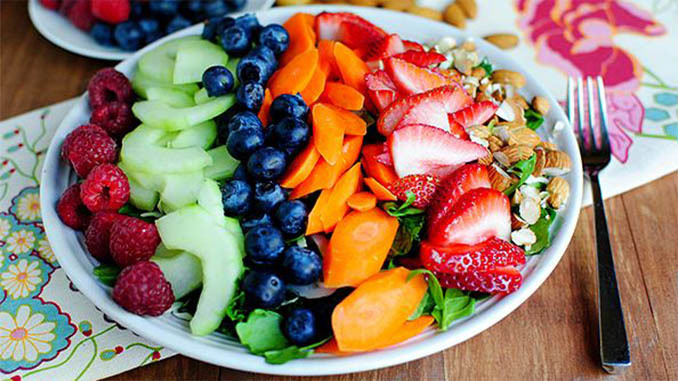 2) Next, add sliced carrots which are high in skin and eye-loving vitamins, followed by blueberries which have the highest levels of antioxidants of all fresh fruits, helping to keep skin younger looking. 3) Finish with sliced cucumbers which help support healthy hair, skin and nails, and raspberries which protect the skin from free radicals. The salad recipe above makes 1 serving and has a total prep time of 10-15 minutes. Once finished it should have a sweet, earthy, crunchy and chewy taste to it. Add some pomegranate vinaigrette (or any good, olive-oil based) dressing on top and enjoy this immaculate detox salad for lunch or dinner!